For most tourists, France is synonymous with Paris and the iconic Eiffel Tower. Sadly, that is pretty much all it is for those who’ve not taken the time to explore the other options that this great country has to offer. Travelling through the French countryside is an excellent option for weary tourists that tire of running around in the crowds of the “must see” locations and would rather experience something new. If you also feel like this, why not experience a slower paced holiday and enjoy the natural beauty of these regions? Here we´ll take a look at Normandy, a perfect spot for your next holiday to France. Normandy is a region located in Northern France that enjoys breathtaking natural landscapes and a long coastline. The region offers several settings that can easily occupy you for the whole duration of your trip. Traditionally, tourists choose to focus either on the seaside or the countryside locations. It is true that you can do both, but rushing to cover all the fantastic places available would simply defeat the purpose of visiting in the first place. The interior is a traditional hedgerow country of great natural beauty; quite literally, it is the thing that postcards are made of. The picturesque geography of its outdoors presents golden plains and undulating hills, lush pine forests and mysterious beechwood groves. On the other hand, if you decide to visit Normandy’s coastline you’ll find thin and long beaches dotted by harsh cliffs that overlook the sea. 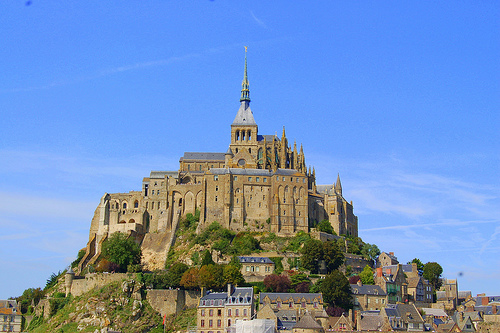 Popular sites include the shores of Seine Maritime and Mont Saint-Michel. While there are many beautiful places in the region, it’s hard not to make a special mention of the Seine Valley. The location is part of the course of the Seine river, which crosses the whole of Normandy from east to west, as it runs under steep cliffs and across gravel plains to reach the sea at Le Havre. For centuries, this valley was the only route that connected the French coast and the interior. Even today, we can see the waters of the Seine being travelled by a number of barges, carriers and pleasure boats that make their way between the ports of France. Travellers that follow the watery route of the Seine will be able to visit a number of lovely towns such as Vernon and Bonport Abbey. Most tourists follow this up with a prolonged tour of the “Route des Abbayes,” a circuit that visits several historic abbeys, monasteries and monuments that have been preserved throughout the years and make for a memorable sightseeing experience. Great information. I have heard that Normandy is a beautiful area, but I knew it mostly for its beaches. I’m going to be in France in the next two years, but I’m not sure I am going to make it to Normandy. There is so much to see in France to see that it would take a really long time to explore it all. Indeed, the Mont Saint-Michel is very impressive, especially on a rainy day. For me, Normandy is very special because my ancestors came to Canada from there and my surname is very popular. Steve, thank you for your comment. Have a great time in France! Eurotrip Tips, thanks for your comment. Nice to hear that Normandy is special to you. It really is an amazing region of France.